Browse: Home / What Is Radon? Radon gas is the leading cause of lung cancer for non-smokers. According to the EPA, radon is estimated to be the cause of 21,000 lung cancer deaths per year. Radon gas cannot be seen, smelled or tasted. The only way to know how much radon is in your home is to run a test. Radon is radioactive and has a half-life of 3.8 days. When a radon atom decays, it releases an alpha particle of radiation. Normally, alpha particles are too large to harm a person – they can’t even penetrate the skin. However, when a radon atom is breathed in and the decay occurs when the particle is in the lung, it could damage the lung tissue. Enough damage over a long period of time may cause lung cancer. This risk is increased exponentially for smokers. The origins of radon start from Uranium. Uranium is found naturally in the stone and soil in the ground. It has a half-life of 4.47 billion years. Once it decays, it becomes radium. Radium is a solid so it is not considered to be an airborne threat just yet. Once the radium particles decay, they become radon, which is a gas. As a gas, radon is free to enter people’s homes through openings in the foundation. The process of radon entering into the home is further aided by the “stack effect” of a house. The stack effect is a result of warm air naturally wanting to rise. As warm air rises and leaves a house, it creates a negative pressure underneath the foundation. The air leaving the house has to be replaced which forces the air from underneath the foundation to be pulled in – and with it, comes radon gas. How Much Damage Does an Alpha Particle Really Do? This is a plastic chip from a radon testing device called an Alpha track detector. It was exposed to the EPA Action level of 4 pCi/l of radon for 3 months. 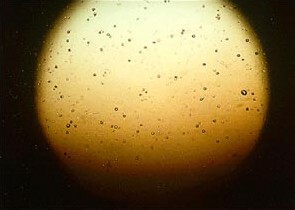 The pitted areas caused by the breakdown of the Alpha particle are clearly visible when viewed under a microscope at only 100 times magnification. Although the above alpha track detector is plastic, some of the original alpha tracks were made of glass, the alpha particle had the same effect on glass as it did on this plastic.